This assembly kit creates a special black metallic version of the Plasma Edge II, an exciting buggy capable of super offroad driving! Both the dynamic body and the large wing are given a black metal-plated finish, and come pre-cut for your convenience. Simply cut out and appply the dedicated stickers, and your body is ready! Star dish wheels and white CVA oil shocks round off its stunning looks. The TT-02B is a dedicated off-road buggy chassis that offers hassle-free assembly and maintenance, as well as superb controllability. 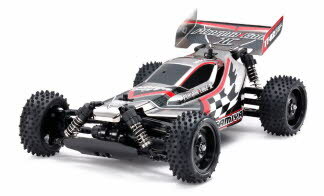 The shaft-driven 4WD TT-02B buggy chassis employs a skid-shaped frame. Its suspension setup uses 4-wheel independent double wishbone suspension with long arms, plus white CVA oil shock units, giving the car assured handling, while left/right suspension arms and uprights are identical to facilitate hassle-free assembly. Front/rear gearboxes include 4-bevel differentials for smooth operation, and are sealed to ensure that dust can't get inside. The tops can be removed simply by loosening a few screws, making maintenance a breeze. 4 different gear ratios can be applied with the use of 3 separately-sold types of pinion gear, allowing you to match the characteristics of your car setup to the conditions at any given time. Of course, this off-road chassis also includes receiver case and motor cover to protect them from dirt and debris thrown up off of the track.